Gardening is such a part of my studio practice that just as the garden begins to green, I feel as if my mojo to paint also quickens after the stupor induced by the cold and dark days of winter. A big change in the "butterfly/rose" garden is that the wood chipped paths are being switched to pea gravel. My dearest Naomi boycotted her sandbox and playhouse because she asserted the wood chips hurt her bare feet. So this summer, I am hoping to avoid the almost daily requests that I carry her to the safety of her sandbox and back to the lawn in order to protect her princess feet :). Some early daffodils are in full bloom, and the tulips are all far enough along that flower buds can be found on most plants. I am sooooo excited this year about the tulips. I cannot wait to see how they look in the garden and to then bring them inside to paint. My wild back boarder is also beginning to green. 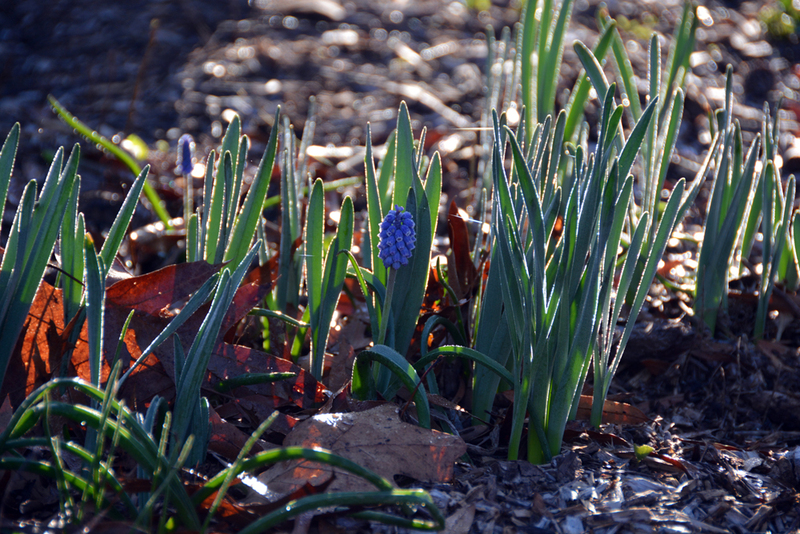 The hydrangeas all have green leaves, and then other early spring flowers are also peaking out of the turf. Primroses, pansies, some tulips, and daffodils. Even the scillia siberica that I planted the year before looks to be colonizing and spreading along side some lupine. And even as the temperatures rise here in the mid-Atlantic, the hellebore is still going strong. I gotta get some more of these inside to paint as well.